A funny world, Amazon. As I’ve said, we’re listed on both sides of the Atlantic but each ‘house’ treats its products differently, albeit the same product. So our entry for ‘Memories’ on the American and Canadian sites carries ‘customer reviews’ — they are spontaneous, believe me — that bear no relation to those on the British site. 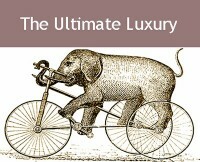 Elliot M, the subject of our last post, has given us a lovely write-up on amazon.co.uk. Meanwhile, the following has recently appeared on amazon.com, for which we are also truly grateful. ‘I really loved this book. 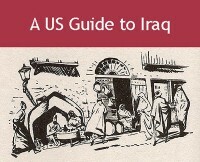 Both of my parents were born in Iraq and witnessed first hand both the delightful times as well as the periods of intense fear and uncertainty. It is awful that centuries of good will between Arabs and Jews were to be shattered by the rise of Nazism and the Arab alliance with Hitler. The signature is “waldo558” — a resident of Mendham, New Jersey. So far this year our travels to promote the book have taken us to events in London, Tel Aviv and Montreal. Towards the end of October we are planning a big trip to the USA and Canada again, with San Francisco, Los Angeles, Washington, New York and Toronto on the itinerary so far. More later as details firm up. While the purpose of these events is to bring ‘Memories’ to the attention of a broader audience and sell books, one unexpected spinoff has been the way they have resulted in broken links being restored between people who have lost contact with one another. Most particularly, in Mira’s case, meeting up with long-lost relatives and friends whom she hasn’t seen since childhood. It’s a lovely surprise, greatly satisfying. Mira has consequently acquired a whole new bunch of correspondents writing about family connections and the family tree. We have been particularly touched by an email this week from someone (who may or may not be a distant relation: she’s still trying to work it out) whose reaction to the book has been precisely what Violette was hoping for. She wrote with the younger generation in mind to make them aware of the bygone era which was so very different from the perception of the Middle East that is current today. The message is from Elliot, a 30-year-old Londoner of Iraqi-Jewish extraction who has asked us to withold his surname. Here is an edited version. 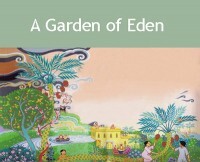 Many thanks for the publication of ‘Memories of Eden,’ which I finished reading last week. I was so impressed that I’ve since ordered three more copies, to give to family and friends. To me at least, it’s hard to underestimate the importance of the book. In addition to being a pleasure to read, and an enlightening window to another world another time, ‘Memories of Eden’ gives a disarming human perspective to a forgotten chapter in an ongoing saga, the twists and turns of which continue to decide the fate of the world today. Particularly with my generation, there’s little awareness about the way our grandparents lived, the food they ate or the language they spoke. That world would seem so ‘Arab’ to us, and as British Jews, we associate being ‘Arab’ with an image of a backward enemy — a character in a reconstructed narrative played out on the daily news. 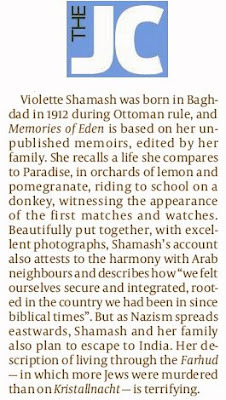 Likewise, amongst young British Muslims or British Arabs, there’s almost no knowledge that Jews and their grandparents once lived peacefully together in the Middle East — that there wasn’t always a divided ‘them and us’, just as it wasn’t always Shia against Sunni. This is made all the more prescient to me through my partner’s family, who are Syrian Muslims. Between our own group of friends, all with a link to the Middle East, we founded a small and fleeting ‘Arab-Jewish’ organization called Yalla!, which made the Guardian news during the 2006 war in Lebanon. Firstly – to thank you both and your late mother for a beautifully written and enlightening book. Secondly, as someone constantly reminded of my relatively unknown heritage by my own appearance, to reach out and make contact for contact’s sake. for this very nice review. At last, a chance to bring Memories of Eden more to the front, courtesy of the BBC. 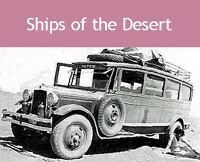 The fate of the Jews who left their homes in Arab countries following the birth of Israel is not nearly as well known as it ought to be. The world hears of the plight of the Palestinians but what of the stories of the hundreds of thousands of Mizrahi Jews, such as those who had to leave Iraq, who were forced out? Mira has been asked to participate in a BBC radio discussion on the subject and went to a radio studio in Monaco today to pre-record a couple of readings from the book: one concerning the harmonious state of affairs that prevailed between the various religious communities in olden days; the other, a vivid extract about the 1941 pogrom, the Farhud. BBC World Service radio will be broadcasting the programme in Newshour, which goes out at 12.05 GMT tomorrow, 21 June. If you miss it you can tune in here and listen at a more suitable time. In addition the BBC has started a blog on which people can leave comments: Have your say. 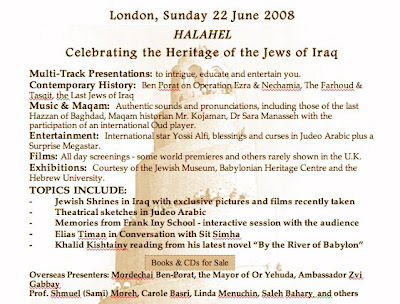 We’d like to draw everyone’s attention to something unusual taking place in London this Sunday, 22 June: a celebration of Jewish-Iraqi culture that is shaping up to be something both remarkable and unique. The flyer explains it all. Well, nearly all. The organisers invited us to attend to give a talk about Memories of Eden. Naturally, we were delighted — but there was no way that Tony could make it from our home in the South of France as he has just had a hip replaced and is hopping around on crutches. Mira is going, however, and will be appearing on the platform alongside our old friend and mentor, Professor Shmuel Moreh from the Hebrew University. So please give support, everybody! So, t’beet (or not t’beet, says Tony; that is the question, for you have to be very enthusiastic to want to make this dish. Preparation time is long and cooking time longer!) This is the chicken dish our mothers would prepare on Friday for the slow cooking necessary to have it ready for Saturday lunch. The bird was most likely to have been a hen as there was more to it and nothing was wasted. She would use the giblets (gizzards and heart chopped small in the stuffing); in the hen she would also find eggs in different sizes waiting to mature and be laid one by one – these were also cooked with the rice. But the prize was the membrane through which the egg was laid, beit il weld, the house of birth. This too would be stuffed! So now, if you are serving a family you should use a chicken or a capon for a party. A word of warning: before you set off, make sure you have an oven-proof dish with a tight lid large enough to hold it all. 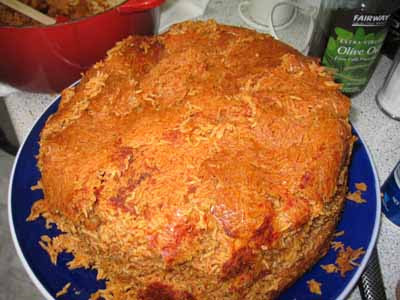 Parboil half a cup of the rice then drain. When cool, mix with the chopped meat, half the spices and 1 tsp salt. Stuff loosely into the cavity of the fowl and close it. Put a large pot on a medium flame, heat the oil then add the chopped onion and the stuffed chicken and sauté till golden brown. Carefully remove the bird. Now add the rest of the chopped tomatoes the remaining spices and salt. Add the tomato purée and two cups of water. As soon as it simmers, turn off the flame. Now bring out the oven-proof dish, put some oil on the bottom, then add the hot liquid, add the remaining rice, and carefully place the chicken on top and close tightly and slip it into your pre-heated oven at 200º. After 30 minutes turn the temperature down to 130º and cook for five hours, or longer depending on the size of the bird. There should be a thick crust at the bottom – the pièce de resistance, the h’kaka. Take it out of the oven and let it rest 10 minutes without lifting the pan lid to loosen the crust. 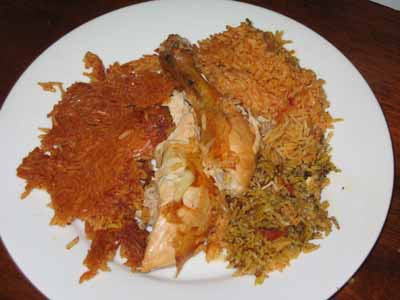 To serve, place the bird at the centre of the serving dish with the rice all around and carefully arrange the crusty rice on top. If the crust is stuck add little water to the bottom of the cooking dish and it should soon come off.